The following tutorial describes the conversion of a file created with Adobe Fireworks to a PDF document with the help of the novaPDF printer driver. If you do not have novaPDF installed on your computer, use the Download page to download and install the application locally. The Adobe Fireworks application is an editor for bitmap and graphics vector which was previously owned by Macromedia and later on bought by Adobe. It is available either as a separate tool or as part of the Adobe creative suite and has support for Windows and Mac OS. The current version of the program is CS 5 and the "native" extension is the png format. Adobe Fireworks has been created with web production in mind, having a good image compression with most of the graphic files around. Also works well with other Adobe applications in terms of workflow as it can export and import pretty much all the other formats. The language support is also good and custom languages are available for using. The users can save the graphic files in PSD, SWF, PICT, BMP, WBMP, TIFF, PNG, GIF, JPEG etc. This would be a great alternative for fast prototype websites and interfaces for different types of applications. Despite all these advantages however the license for this is still highly proprietary which means that interactivity and portability support is limited. For projects involving multiple people and from several places that may not have adobe products installed as well as the designer this would be pretty inconvenient. This is why sharing the files created with Fireworks as PDF documents and using novaPDF as the PDF converter for the useful extra features available would be a huge advantage. With novaPDF the user can also sign the converted files, can add bookmarks and watermarks, can add security features to them, can send the files over the e-mail on the fly, can merge the newly created PDF with other PDF's and much more. To successfully convert your Fireworks file to a PDF document first search for the file you want to convert by clicking on File->Open or pressing Ctrl+O in the application interface. 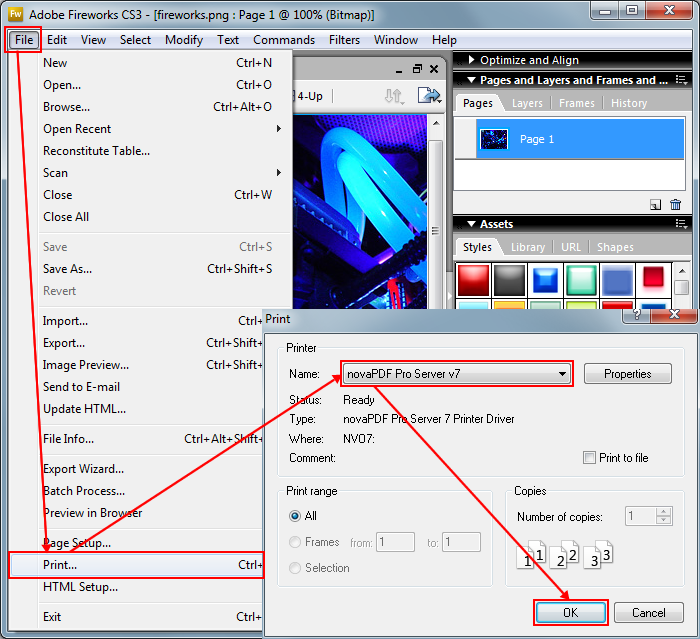 After you have loaded the image, click on File->Print or use the Ctrl+P combination and in the Print window select novaPDF from the printer dropdown list. Click OK and in the Save PDF File As dialog, choose any after save actions you want the application to make on the created PDF document and click OK. The conversion will be completed.